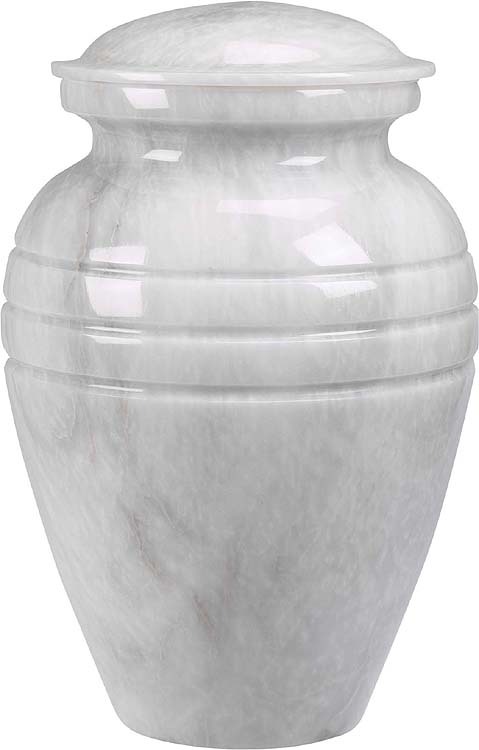 This Beautiful White Grain Marble Urn is bottom-loading with a secure threaded plug. The threaded plug offers a much more secure closure than most marble urns that have a lid that sits on top the urn. The bottom of the urn is lined with felt to protect your furnishings. As with any urn, it is recommended to keep the cremains in a sealed plastic bag inside the urn. An optional Medallion Name Plate with Bright Brass Edging is available to personalize your urn. It can be engraved with name and abbreviated dates or name and a short sentiment. Please limit engraving to no more than about 26 spaces for name and no more than about 30-33 spaces for dates or sentiment. 11 1/2" Tall x 7.5" Wide and has a volume of 205 cubic inches. Also available in a small size and keepsake size. See our Keepsakes Category or Youth and Infant Urns Category.